Menominee started out as Wilson & Furness-Leyland Line's Alexandra. Built by A. Stephen & Sons of Glasgow, she was launched in 1897 and made her maiden voyage from Glasgow to New York on 8 October 1897. She was sold to Atlantic Transport Line in 1908 and made one London-New York roundtrip for ATL under her old name before being renamed Menominee. She remained on ATL's London-New York route until 1905, when she was switched to Red Star Line service. (ATL had become part of J.P. Morgan's International Mercantile Marine combine in 1902. Red Star was one of IMM's original lines.) For Red Star, she served on the Antwerp-Philadelphia route until Antwerp was occupied in 1914. She then made one London-New York sailing for Red Star before returning to ATL while remaining on the same route. 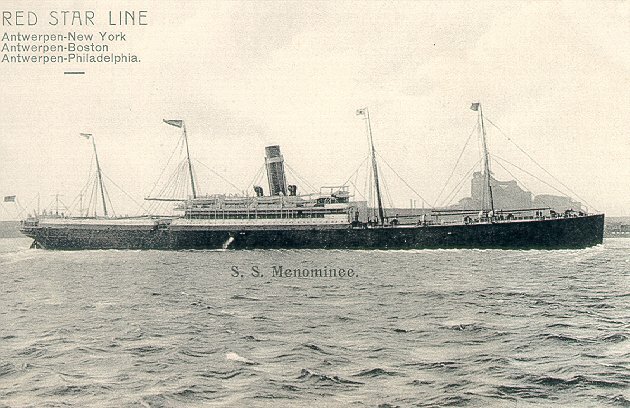 Menominee was taken over as a British transport in 1915, and returned to ATL service as a cargo carrier in 1920. She was scrapped in 1926.